“Growing up with Scoliosis: A Young Girl’s Story,” by Michelle Spray, was such a pleasure to read. I really like this book. The story is interesting and well-written and makes for a nice, easy read for all ages. This book is great for parents or young Scoliosis patients alike. I read it in a few days and found that Michelle did an excellent job of taking a difficult time in her life, and putting a positive, lighthearted, and whimsical spin on it, through snippets and stories from her youth. Some of the information is out-of-date, as surgical procedures and recovery times and situations have changed dramatically, but the stories and emotions she experienced while growing up are still very applicable to patients today. I want to encourage everyone to consider giving this book to your Scoliosis patient this holiday season, and now you can also help Michelle make strides in bringing this beautiful book to you in ebook and audio formats by supporting her Kickstarter Campaign – Click here to see a video by Michelle and to view more details. I hope you enjoy her stories as much as I did. The closer we get to my daughter’s surgery (19 days now), the more it feels like it will never arrive. It’s not that we are excited for it, like when you want Christmas to come and it seems to never arrive. But, it feels surreal – like we fought it for so long, we tried to avoid it, we never thought we’d have to live through it, yet here it is, right around the corner. Maybe we still have a tiny bit of denial. Maybe in some ways it feels like a failure of all the effort put out so far – but, I know logically that it isn’t. My daughter even commented to me the other day that she feels like it’s not really happening. We have gone through so much so far – journeyed physically very far to accomplish our Scoliosis goals, but now we are faced with the biggest adventure of all – mentally preparing for this thing ahead of us. Just thinking that by the time Christmas comes, we will be done – it doesn’t seem real. Yet it is. Besides getting our “ducks in a row” with our home, work, and other affairs, there is really not much to do to prepare, so we just carry on with our busy lives – use the distractions of the mundane and routine things of life to keep the big “S” out of our minds. Yet, it is always there, and we know it, and it is a huge unknown – what will things be like on the other side? We hope and pray for the best, but I know that it will be an emotional adventure from the time we leave home until the time we get back and beyond. We have no other choice but to take it on – barrel through it. It won’t be easy, but, from what other Mom’s have told me, it won’t be as bad as we think. I know that, for me, the emotions will be high, and my inner strength (and my daughter’s, of course), will be tested. I know, though, that people can grow and benefit from such tests. My daughter gets that (see this in her own words in the previous post) and she has shown me that I can learn a lot from her. As always, your prayers are appreciated. They will get us through this. “Hey everyone. I know you have probably heard about my upcoming surgery. I have been getting a lot of support from family and friends. Even strangers, actually. Honestly, it’s a little weird getting all of the attention. You don’t have to stop being attentive (by all means, keep it up!) 🙂 It’s weird having gifts show up at the door from someone I’ve never even heard of. Plus, since Christmas is coming up soon, I have that, too. For some of you who have heard about or know me, I may seem…brave. But, I’m really not. I’m actually scared (who wouldn’t be?!). But, that’s okay, as long as I don’t let that fear overcome me. Sometimes it’s actually good to be scared, because then you learn to overcome your fears. There are many good things about this, though. Once I’m “fixed”, I can do anything I want to the fullest. Nothing will be holding me back from hobbies or athletics. One of my favorite sports is basketball, and I have found that doing some things can be more difficult for me than anyone else. Really, when you think about it, it’s a fantastic opportunity. Today is a quick summary of Dr. Mark Morningstar’s article “Outcome Observations in patients using a scoliosis activity suit: A retrospective chart review after one-year follow-up,” in the Journal of Scoliosis Rehabilitation, Oct 4, 2013. I will try to provide a direct link for you just as soon as I find one. 🙂 This article summarizes one-year data for patients in the Tornado Suit, also known as the Scoliosis Activity Suit. This video explains some basics about the Tornado Suit: Dr. Stitzel, a Scoliosis Activity Suit practitioner. The Tornado Suit (TS) was developed as the anti-brace, or activity-based suit. This neoprene suit is activated when the wearer is active, and it provides rotational resistance to the spine, which, theoretically, causes the postural reflexes and muscles to adapt and work toward correcting the Scoliosis. The study took data on a total of 62 patients, both skeletally mature and immature, at both the time of fitting the TS and one year afterward. Patients wore the suits 1-2 hours per day for the first month, gradually increasing to 4-6 hours per day over the next 90 days. Only standing, upright time was counted toward the total – this is an ACTIVITY SUIT after all. 🙂 Before the 12-month assessment, the patients were asked not to wear the suit for the 24 hour period beforehand. Patients were divided into two major groups (Adults with Risser>5 and Skeletally immature patients with Risser<5), then both were separated into an additional 4 categories: Thoracic curves, Lumbar curves, Thoracolumbar curves, and Double Major curves. The results were positive – improvements in Cobb Angle and Angle of trunk rotation (ATR) were observed in all patient categories, except for the adolescent double major curves. All of the adult patients noted improvements in pain and daily function. Scoliosis correction was observed in 48% of the entire cohort, with 42% of curves stabilized or unchanged after one year, with the thoracolumbar patients seeing the greatest improvement. Dr. Morningstar, of course, goes into much more detail in the actual article, but, as with all studies, there are certain limitations. First, there was no control group or objective tracking methods to ensure patient compliance. All data about compliance and comfort were based on the honesty and accuracy of patient participants. While I cannot believe that patients would intentionally jeopardize a study, unintentional mistakes could have been made. Also, it is difficult to know if some of the adolescent patients would have stabilized on their own over time. As the article points out, the best way to determine the success of the TS is to continue with longer-term studies. But, the bottom line is that 90% of the cohort were either stabilized or corrected, and this is promising news. Although not specifically pointed out by this article, I have to continue to make the point that ANY treatment is going to have a higher probability of being successful if employed EARLY ON in the development of Scoliosis. Do NOT wait and see just how bad it will get – act early! I would recommend action by the time the curve reaches 20 degrees, if not earlier. This is a great treatment option for the patients who want to be proactive and are early on in their curve progression. But, the data also shows that Adults with Scoliosis, an often overlooked category, can see new hope for improved comfort by using the Tornado Suit. We have used it as part of my children’s treatment, but my daughter’s curve was far past the level for any type of rehabilitation to be successful by the time she started using the TS. That does NOT mean that it is not a promising treatment – early intervention is always key. The basics of spinal fusion. After spreading the news last week that my daughter’s surgery had been moved up a few months, I had many people ask me exactly what she was going to have done, so I thought it would be beneficial to do a layperson’s attempt at an explanation. This article was a bit difficult for me to write, because when I started researching and pulling up images, I sometimes was greeted by not-so-splendid images. But, it was good for me to learn as much as I can before the big day (December 16th). In general terms, my daughter will have a spinal fusion surgery. The Doctor opens up her back, cutting through the muscle and fat tissues, to reveal the spine. She will use bone grafts, both from my daughter’s own spine and from cadaver bone donations. It used to be that bone donations were taken from the patient’s hip bones, but this is thankfully no longer the case. What would happen is most patients would experience more pain at the donation site than the spine. Thankfully, the Doctors have developed a method to avoid additional incisions and possible pain to the patient. The bone grafts are placed in between the vertebra to create a fusion point – the fusion essentially is a welding process. 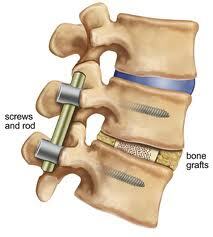 Once the bone grafts take hold, the spine will no longer be able to move in between the vertebra that are fused. The fusion will take months to become solid, so the Doctor will also insert rods and screws to hold the fusion in place. The rods and screws will stay in her body forever. The Doctor uses some of the fragments that come out of the bone in the drilling process to fuse. What they do not get from the drilling process (her own spinal bone tissue), will come from cadaver bone. She was slightly “weirded out” by the thought of dead people bones in her body, but realizes that this is like any other donated tissue or organs and vital to the success of the operation. 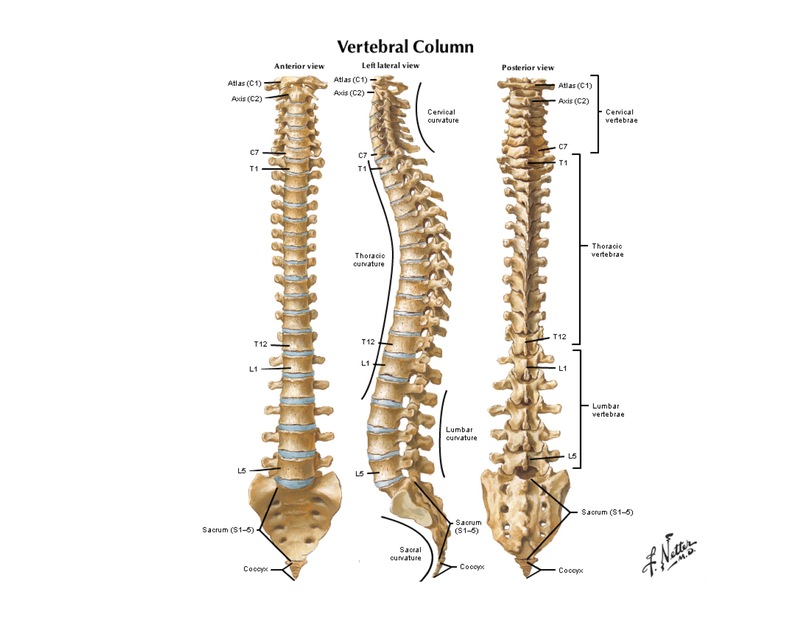 The number of vertebra that are fused depends on the severity of the Scoliosis. Some patients get their entire spine fused, but our Doctor estimates that our daughter will only need fusion between approximately the C7 through L1 (see the diagram below). In other words, her Thoracic spine and a bit into her Cervical and Lumbar. Although she has curves in both the Cervical and Lumbar, our Doctor feels that it won’t be necessary to fuse there. This is good, because we want to minimize fusion so we can maximize her mobility. Most of us rarely bend our Thoracic spine – she won’t be able to do back bends in yoga, but most of her movements should be successful. She also won’t be able to get chiropractic adjustments. After surgery and most of the healing is done, we will probably journey back to Luke at Orthotic Solutions in Fairfax, Virginia, to get a new brace made. Yes, we will probably brace AFTER surgery until she is fully grown. The reason is that once the Thoracic (the worst curve) is fused, the Doctor fears the Cervical and Lumbar areas could continue to worsen because her spine will continue to try and curve. With the main curvature area fused, the spine may attempt to overcompensate and curve more in the other regions of the spine. Also, it is common for stress to occur at the top and bottom of fusion sites, especially as the patient finishes growing. Therefore, a brace after surgery will help keep the spine aligned as she finishes growing and the threat of further curvature goes away. 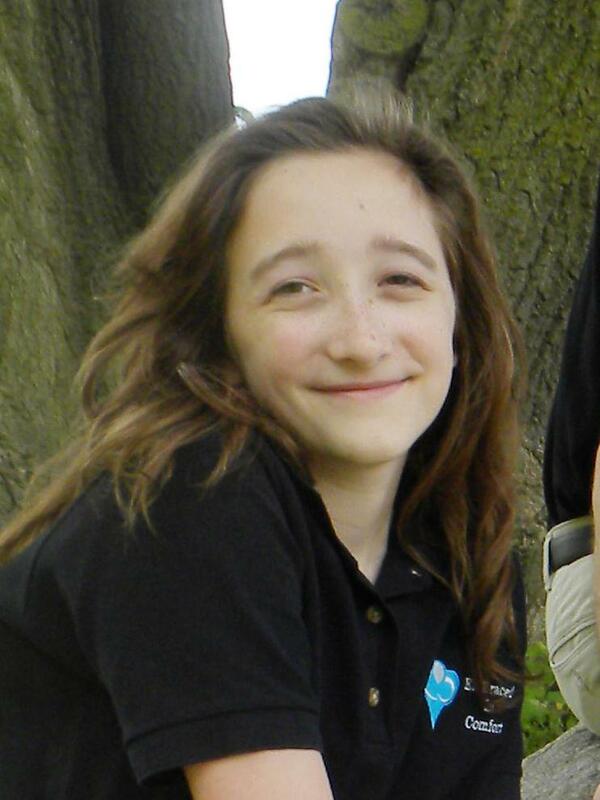 Recovery consists of about 5 days in the hospital and an additional 3 weeks until she can go back to school. And, she may only go part-time for another month, depending on her comfort level. We will only have one week (the week of surgery) before school lets out for 2 weeks for the holidays, so this is good timing in terms of not missing school. But, we are not concerned – she is an excellent student and her teachers are fully supporting her in any way they can. Her Principal is, too (her Dad!) 🙂 The surgery will take 6 hours or more and the physical therapists will have her walking on day two. She will have to re-learn basic movements, like walking, rolling, sitting up, etc, so that she can accommodate for the fusion. The Doctor said that our daughter’s surgery may be more extensive at this point, because of the severity of the curve. The Doctor may need to remove sections of the vertebra to create enough space for the spine to bend back over and line up (I don’t understand all the details of this, but I do understand that it can make surgery more lengthy). However, it should not increase recovery time. Pain medication will have to be administered around the clock for a couple weeks, but most patients are off pain meds completely by the end of week 2, which is amazing to me! So, that is what the plan is at this point, but, as I pointed out in my last blog article, the best laid plans often go astray. So, we will continue to hope and pray for the best outcome, knowing that we have done all we can do and that we have assembled the best Medical team.